Chorizo and Shrimp Quesadillas with Smoky Guacamole! I really missed to write you here. Thanks to all who already follow my blog and also leave some comments. I’m so glad we can share this blog. Today’s recipe is an ideal appetizer but works as a very delicious lunch: Chorizo and Shrimp Quesadillas with Smoky Guacamole! As you might have noticed, since I work and also take care of my family (my 2 years old baby and my husband) I prefer all the easy-to-prepare recipes which also are healthy and delicious. Cut avocados all the way around with a sharp knife. Scoop out the pit, then spoon avocado flesh away from skin into a food processor. Add the juice of 1 lime, a couple of pinches salt, sour cream and chipotles in adobo. Pulse guacamole until smooth. Transfer to a serving bowl. Heat a 12-inch nonstick skillet over medium high heat. Brown chorizo 2 to 3 minutes, then remove from pan. Add oil, garlic, then shrimp. Season shrimp with salt and pepper and cook shrimp until pink, 2 or 3 minutes. Transfer shrimp to a cutting board and coarsely chop. Add a drizzle of oil to the pan and a large tortilla. Cook tortilla 30 seconds, then turn. Cover 1/2 of the tortilla with a couple of handfuls of cheese. Arrange a layer of chorizo and shrimp over the cheese and fold tortilla over. Press down gently with a spatula and cook tortilla a minute or so on each side to melt cheese and crisp. Remove quesadilla to large cutting board and repeat with remaining ingredients. Cut each quesadilla into 5 wedges and transfer to plates with your spatula. Top wedges of quesadillas with liberal amounts of smoky guacamole. Hope you like it. Until the next time! Still looking for a healthy and easy snack for the Super Bowl, but you don´t want to miss the classic guacamole? 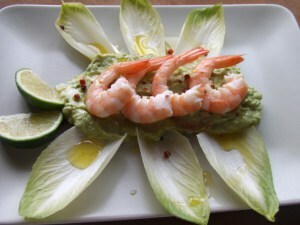 Well here’s a nice option with guacamole, but with a very fresh twist. And it’s easy to prepare! For this recipe is a good idea to take more cucumbers than the needed to cut them into strips and serve them as dips for the rest of the guacamole. Wash and dry the cucumbers to make a cut after ¾ cucumber. Make the guacamole and spread it over the cucumber, then dress it with salt and pepper. Take the cucumber strips with guacamole and wrap them up and serve them. Enjoy and may your favorite team win!